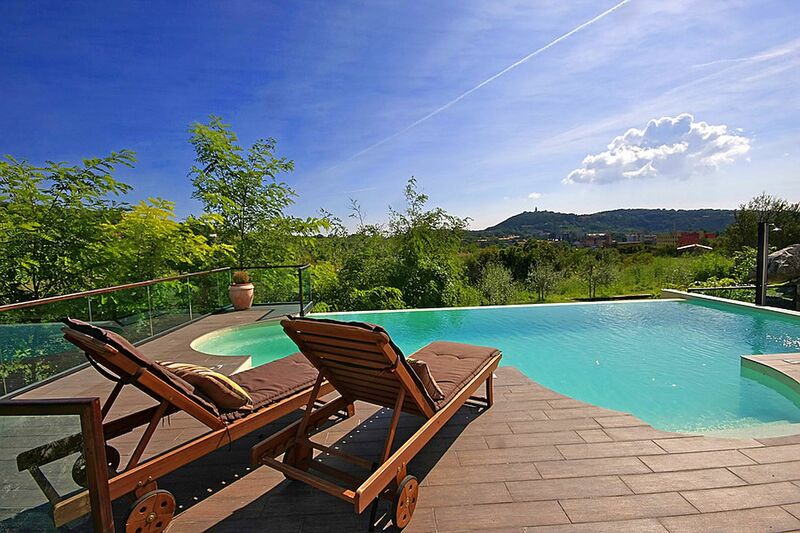 Vila Amneris is an attractive, completely renovated old stone house located on an elevated position at the outskirts of the town Labin. On its own, partially fenced ground of 4.000 sqm with a lovely panoramic view, the guests of the villa have on their disposal a 38 sqm large private swimming pool, sun terrace with sunbeds, three terraces with sitting sets, a tavern, barbecue, children’s playground, boccia court and two covered parking places. 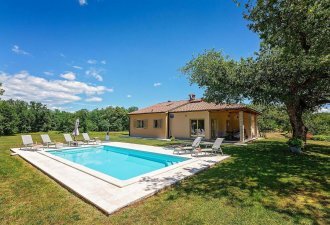 Villa with pool for 4-6 persons with a living area of 115 sqm, furnished with modern style high quality furniture with typical Istrian details. The villa consists of a kitchen, living room with dining area, two two-person’s bedrooms, one with a double bed and one with one double and one single bed, shower/toilet and a separate toilet. In the tastefully furnished tavern which is also attractive thanks to one wall which is practically a stone on which the tavern has been built, there’s one more completely equipped kitchen with dishes, a dining table, satellite TV and a one-person’s sleeping couch.